이 글은 트렘프 정부의 외교정책과 미중관계 전망을 살피는 것을 목적으로 한다. 트렘프 외교정책의 특징은 트렘프의 변덕스러운 스타일과 대결적 정책과 연계된 우파 표퓰리즘에 바탕을 둔 미국 우선주의, 신고립주의, 보호무역주의, 역외균형 전략으로 집약될 수 있다. 트렘프의 대외정책은 상당히 변동적이어서 일관성이 결여된 측면이 있는데, 이러한 경향은 장기적인 전략적 견지에서 미국 국익에 손상을 초래하고 미국의 우방국으로 하여금 미국을 향한 헷징전략을 구상하게 할 것으로 생각된다. 미국의 TTP 철회에도 불구하고 아태지역은 여전히 미국의 전략적 세력권으로 아시아중심축 전략은 계속 견지될 것으로 보인다. 대조적으로 시진핑은 아시아 인프라투자은행과 같은 다자개발협력조직을 이용하여 `일대일로`라는 대전략을 추진해오고 있다. 이는 중국의 이웃 국가들이 중국의 풍부한 자본을 이용하여 신속하게 발전할 수 있는 기회를 제공한 것이 틀림 없다. 중국의 21세기 신실크로드 전략은 참여국들의 친중국화 현상을 낳을 수 있을 것이다. 미중관계에서 동중국해ㆍ남중국해 영토 분쟁, 불안정한 양안관계, 미국의 대중국 무역적자, 한반도 위기 등과 같은 갈등요인이 존재함에도 불구하고 책임 있는 이익상관자로서 양국의 관계는 미래에도 현상유지 정책을 유지할 것이다. The main purpose of this article is to explore the Trump`s foreign policy and outlook on relationship between U.S. and China. 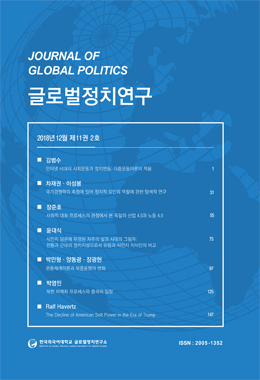 Characteristics of Trump`s foreign policy are as follows: America first, Neo-isolationism, offshore balancing strategy, and protectionism which are based on right-wing populism with Trump`s erratic style and confrontational policies. Taking into account foreign policies propelled at least during first 100 days as president, we can estimate that Trump`s foreign policies are volatile as well as inconsistent. These tendencies in foreign policies could not only hurt American national interests from a strategic and long-term point of view, but also let pro-American partners forge hedging strategy toward U.S. Although U.S. canceled TPP(Trans-Pacific Partnership), she may continue to maintain Pivot to Asia Strategy because Asia pacific region still belongs to America`s strategic Sphere of Influence. In Comparison, China under Xi`s regime also has been vehemently promoting grand strategy so called `One-Belt and One-Road` strategy taking advantage of AIIB as multilateral developmental cooperative organization. China`s 21st century New Silk Road strategy will provide opportunities for China` s neighbors to develop rapidly utilizing China`s abundant capital and lead the participating countries to Pro-China. Despite conflicts such as the East China Sea and South China Sea territorial disputes, the unstable cross-strait relations between China and Taiwan, the US trade deficit with China, and the crisis on the Korean Peninsula, the relationship between the U.S. and China as responsible stakeholder should maintain the status quo in the future.